The VQ35DE is a 3.5L V6 engine built by Nissan for use in a wide range of vehicles from SUVs to high performance coupes. The engine has dual overhead cams (DOHC) and is equipped with Nissan’s advanced electronic fuel injection system to help improve fuel economy. First produced in 2000, the Nissan VQ35DE engine is still widely used today. In fact, it can be found in current models of the Nissan Altima, Maxima, Murano, Pathfinder, Quest and Infiniti QX60. One reason that this engine is so versatile is because it produces up to 300 horsepower but still has fuel economy of over 22 miles per gallon. However, one thing to keep in mind is that Nissan recommends only using premium fuel to power the VQ35DE engine. This engine first rolled off U.S. production lines beginning in 2001. At that time the VQ35DE was built for SUV crossovers such as the Nissan Pathfinder and Infiniti QX4. The U.S. version of the VQ35DE is manufactured at the Nissan Powertrain Assembly plant in Decherd, TN, about 90 miles south of Nashville, TN. The JDM version is assembled in Iwaki, Japan. The fact that this engine has been in use for over 15 years speaks for its performance and reliability. But, don’t take my word for it. WardsAuto has named the Nissan VQ35DE as one of the 10 best engines 7 times since 2002. As we mentioned previously, the reason this engine has received so much praise is because it is a high performance V6 with great fuel economy. While it has seen minor changes over the last 15 years, it has stayed relatively the same. Engine names like VQ35DE can be confusing, but they are full of information. We can learn more about this engine by decoding the name. This engine is part of the Nissan VQ engine family, as noted by the VQ, which has been produced since 1994. Each engine in the VQ family is a V6. This specific model is has 3.5L displacement and dual overhead cams, which is represented by the 35 and D, respectively. Finally, the E tells us that this engine uses electronic port fuel injection. What does VQ35DE stand for? Tuners may recognize the VQ35DE name because it was used in the 2003–2006 Nissan 350Z and Infiniti G35. 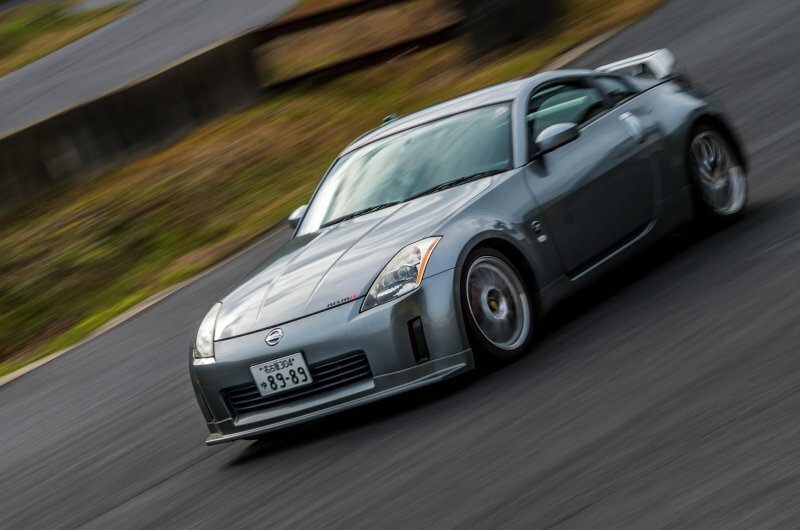 However, in 2007 the 350Z was upgraded with the VQ35HR engine which produced 6 additional horsepower. Depending on which vehicle this engine is used in, it can produce anywhere from 228 to 300 hp. Torque output ranges from 246 to 274 lb-ft. The power output also depends on the transmission setup. This engine has a displacement of 3498 cc or 3.5 L. Measured in cubic inches this engine has a displacement of 213.46. That’s about 1.4 horsepower per cubic inch! Bore is set at 95.5 mm or 3.76 inches and the stroke length is 81.4 mm or 3.20 inches. The VQ35DE replaced the VQ30DE engine which powered the Nissan Maxima from 1995 to 2001. 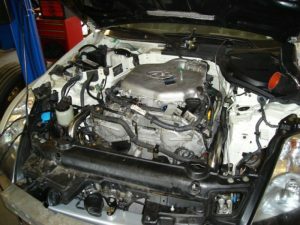 These engines have a similar block design, however the VQ35DE has increased displacement and variable valve timing (CVTCS). It is important to point out that this engine has an aluminum block and heads. The valve train features dual overhead cams with 4 valves per cylinder. Again, one reason this 300 horsepower engine gets such great gas mileage is due to Nissan’s sequential multi-point fuel injection system. Nissan 350Z and Infiniti G35 owners should be thankful the VQ35DE has been used in a wide variety of cars and SUVs over the last 15 years. This means there is an abundance of parts and information available. Whether you want to improve the performance of this 300 horsepower V6 or just rebuild it, The VQ35DE will make your job easy. That’s probably why this engine has been named as one of Ward’s 10 best engines 7 times! Today it is hard to find an engine that has both performance and fuel efficiency. However, it seems that Nissan stumbled upon the perfect combination in 2000 and hasn’t looked back.